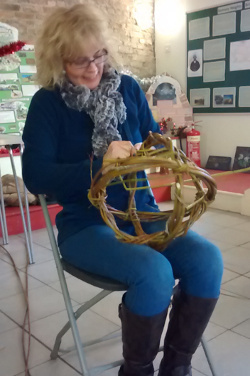 We’re leading a day in the as yet undiscovered craft of making a ball from nothing but willow, on Sunday 22 March, here in Gravenhurst, Bedfordshire. We will be using willow grown on the farm to create something that’s eye catching, beautiful and unusual, but otherwise has no practical value at all. These are purely for ornament. And jolly good they are too. Customers who bought them have placed them in gardens as focal points, used them to support climbing plants, hung them from trees or used them as indoor ornaments (they look great on a hearth during the summer); you do need a generously proportioned house though. The balls we will make on 22 March will be around 12-18 inches diameter (that’s about 30-45cm). The day will be sociable and fun as well as practical and informative. Everyone will leave with something worthwhile and pretty ballish. We will be based in our barn which can have its doors open or closed to regulate the temperature a bit, but if it’s looking cold you’ll need some warm clothes. You’ll need to bring a sharp knife, secateurs (we have some spares if you don’t your own) and some lunch. We supply all materials, tea, coffee, cake and fruit. It’s all a load of balls if you ask me! Can’t make this course but would love to attend one in the future. You are dead right! Shame you can’t make it. Would be good to see you at some point. I keep mentioning you to people – this crazy bloke and his tiny wood in Suffolk! Can I buy 9″ willow balls from you – or can you suggest where I can get them – or do you have a pamphlet on how to make them as I can’t attend your course. Thanks for your message. You may not have noticed that you commented on an old post, written last year – perhaps I should delete it. We are running another course on Sunday 8 May 2016 – is that any better for you? 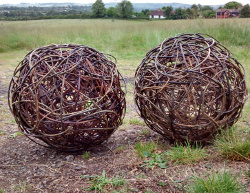 Details here http://wassledine.co.uk/a-day-in-the-woods/courses-and-events/ If not, I could make 9 inch diameter balls for you. If you were to let me know how many you need, I’ll come back with a price; perhaps contact us on info@wassledine.co.uk or call 07794 013876.